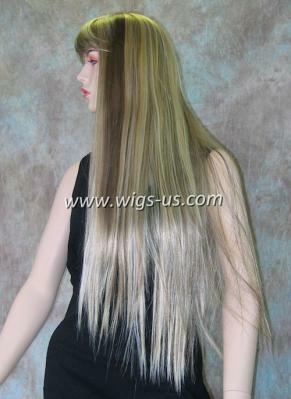 Katheryn by Wig America ~ Looking for extra long hair that you can enjoy wearing, and style in an unlimited amount of ways? The Katheryn by Wig America is here for you. The soft hair fibers reach almost all the way down to your waist. Straight, and full of color, the synthetic fibers were beautifully made to last and withstand all the styling options you have planned for it. Straight across bangs over the forehead compliment the long hair, and add to the overall feel and look of the style. A center skin part helps create the illusion of natural hair growth. It actually appears to look like your real skin where the hair parts. The Katheryn is an awesome wig to wear, at a price you won't find lower. All this hair for such a small price? It's simply amazing that we can offer our loyal customers such a great deal. Take advantage of it today before we run out of stock completely! Select from our special order colors, and get your Katheryn wig today.